Processes are the means by which strategies are executed. Over the long haul, even strong people can’t fully compensate for a weak process. Sure, some success will come from individual heroics. But if you pit a good performer against a bad process, the process will win in the long run. 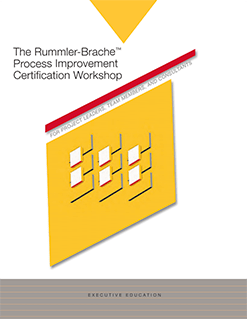 Our Process Improvement Certification Workshop will show you how to design processes that work for … not against your work force. A process approach must be supported by different arteries that facilitate cross boundary communication. Information has to cut horizontally across the system, instead of following the traditional pathways up and down the organization hierarchy. Processes just don’t work well when the various functions are walled off from one another. If information has to struggle up through the chain of command in one department, make it over to another area, then dribble back down that silo to the people actually doing the work, the process is far too sluggish. So the vertical communication patterns must yield to more sideways give and take. Word can get around a lot better moving laterally. How Would You Grade These Performance Improvement Programs? Typical improvement campaigns (i.e. customer focus, process redesign, TQM, cost reduction, cycle-time reduction, Lean, Six-Sigma) focus on only one level. As a result, these efforts do not optimize overall results. In fact, they can do more harm than good if the “fixes” in one area create unintended, negative side effects elsewhere. The right measures can trigger dramatic improvement in the performance of cross-functional work flows. In fact, if you want to single out the one management act that can make the greatest contribution to successful and enduring process management, it would be developing and installing a process-based measurement system. Unless you do that-and do it well-you don’t have a prayer of maintaining powerful processes. How Does Strategy Relate to Process Redesign? There are a wide variety of models for strategy formulation, strategy execution, and process redesign. How do all three areas link together? Project CONSTRAINTS, which are the guardrails within which the new process must function. For example, your headcount and safety policies may be givens. Or, perhaps the process must use the enterprise computer system that you just spent $4 million to install. Before performance at any level can be managed, the expectations for that performance need to be clearly established and communicated. This need is particularly strong at the Organization Level. If we have not clearly defined the business we are in, we certainly cannot effectively design and manage the Organization Level of Performance or establish goals, structure, and management practices at the Process and Job/Performer Levels. Without the guiding hand of a clear strategy, we cannot be sure that we are allocating our resources appropriately, managing our critical business processes, and rewarding the right job performance. As with other performance improvement efforts (TQM, self-directed teams, Six Sigma, Lean, Just-In-Time inventory, etc. ), most organizations can point to the results of their efforts: cost savings, quality improvements, and cycle time reductions. However, there has been more sizzle than steak, more activity than results. In our experience, most failures to realize the potential return on an investment in process improvement arise from committing one or more of the seven deadly sins.